At Laith Family Dentistry, we offer comprehensive dental care for patients of all ages in a relaxed atmosphere. 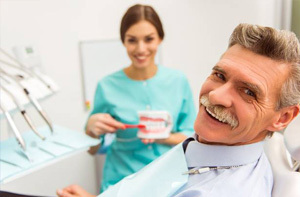 Whatever your dentistry needs, we’re here to help you with gentle, attentive dentistry services in one convenient Northwest San Antonio dental office location. If you’re new to the area or looking for a new dental office to care for your whole family, call our team today. We look forward to seeing you and your loved ones soon. In order to keep your smile whole and healthy, we recommend you bring your family in to see us every six months for dental exams and teeth cleanings. Every patient who visits us receives a personalized dental care plan to meet their unique needs. During your six month exams, we’ll partner with you create a treatment plan that works for you and your family and ensure you maintain the healthiest smiles. We also offer other preventive services such as dental sealants, fluoride therapy, and oral cancer screenings. Our goal is always to help patients keep their smiles healthy and provide early diagnosis when oral health concerns can’t be avoided. Whether you just want to brighten your smile or you’re looking to completely makeover the appearance, our skilled cosmetic dentist offers treatments to create the beautiful smile you deserve. During your cosmetic dentistry consultation, we’ll review all of your available treatment options and help you find the best services to create flawless smiles. We can provide a range of cosmetic dentistry services, including teeth whitening, porcelain veneers, cosmetic bonding, and orthodontic treatment using Six Month Smiles. 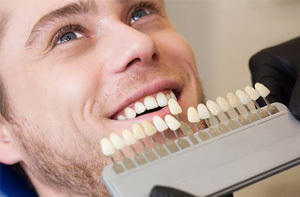 When dental damage or decay occurs, we provide a wide array of restorative services to maintain the greatest amount of healthy tooth structure while fully repairing damaged teeth. Some of those treatments we offer most frequently include tooth-colored fillings, dental crowns, root canal therapy, and dentures. In addition to this wide range of personalized preventive, restorative, and cosmetic dentistry services, we also offer a number of advanced treatments and oral surgeries. Dr. Kadamani and our team are dedicated to offering patients comfortable dental care, and that includes the most advanced treatments. For this reason, we typically recommend nitrous oxide sedation for our patients receiving advanced services. Some of the available surgical treatments we offer include bone grafting, tooth extractions, apicoectomy (root tip surgery), impacted canine treatments, and dental implant placement. 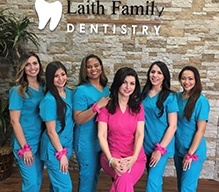 During your first appointment at Laith Family Dentistry of Northwest San Antonio, we begin with a warm greeting and take the time to ensure you and your family feel welcome and right at home. We’ll take your insurance information, answer any questions, and ensure you feel relaxed and comfortable. During your visit, our team will examine your oral and facial structures carefully using advanced diagnostic imaging as well as visual and manual examination. During your exam, we screen for common warning signs of tooth decay, gum disease, TMJ dysfunction, and oral cancer. One of our skilled hygienists will carefully clean your teeth and gums. Finally, you’ll sit down one on one with the dentist to discuss any areas of concern and create a personalized plan to keep your smile healthy.